This year the United Nations brings to the forefront the world's forests in an effort "to raise awareness on sustainable management, conservation and sustainable development of all types of forests." Throughout the coming months, their "forests for people" campaign hopes to showcase the varied strategies and inspired endeavours people take on, on behalf of our forests. In recognition of this global initiative, we take a closer look at one woodland in particular: The City of Toronto's Urban Forest. 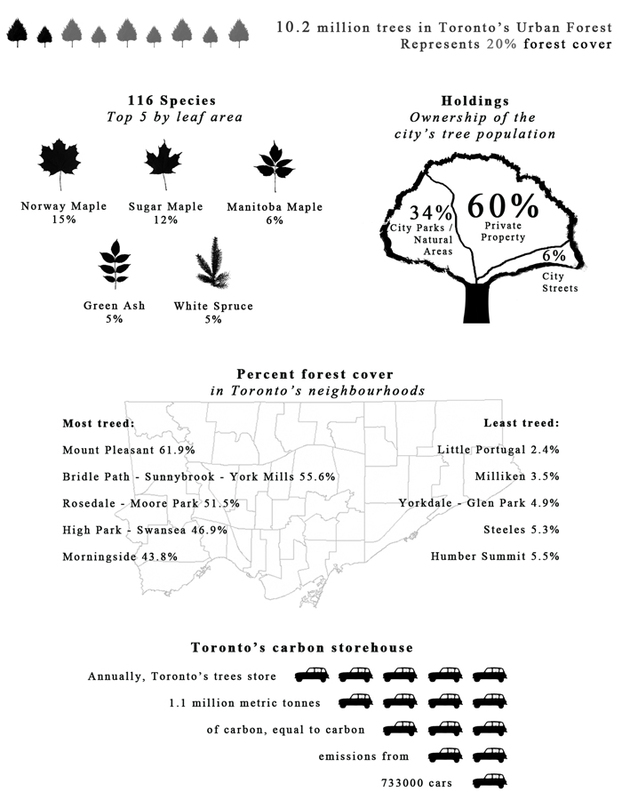 Partnering with the USDA Forest Service, the Northern Research Station in Syracuse and the Spatial Analysis Laboratory at the University of Vermont, The City of Toronto recently published "Every Tree Counts: A Portrait of Toronto's Urban Forest." In brief, we present the report's findings. In 2005, the city set a goal to increase forest cover to 30-40% over the course of 50 years. Toronto's residents, presiding over the majority of the city's tree canopy have responded in turn by leading many grassroots tree stewardship programs. Greenhere, a non-profit organization seeks to increase tree canopy in the Davenport neighbourhood, while in the east end, The Leslieville/Riverdale Tree Project has recognized the area's aging tree population and is actively promoting urban reforestation. For communities wanting to advance urban tree stewardship, Professors Andy Kenney and Danijela Puric-Mladenovic developed Neighbourwoods©, an urban forest inventory protocol. Designed specifically for residents not versed in forestry or arboriculture, the program provides instruction on how to go about collecting data to effectively characterize the composition, condition and distribution of the tree canopy. Many local communities, including Harbord Village Residents' Association and Friend’s of the Don East, have used the Neighbourwoods© protocol. The surveys are a prerequisite for any subsequent programs aiming to protect and improve the urban forest. Whether you would like to hone your tree identification skills, or learn more about what ails your green ash, Toronto's neighbourhood communities are moving forward, providing ample learning programs and creating liveable, greener and healthier spaces.